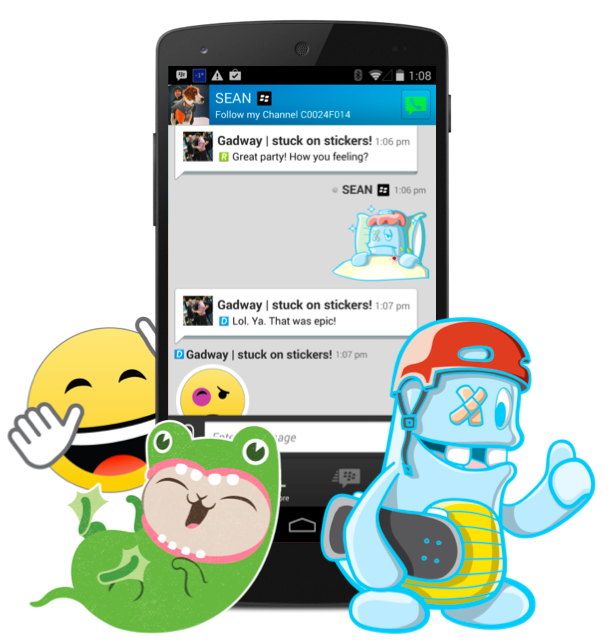 Following Facebook Messenger, Line, Kakako Talk and many other messaging apps, BlackBerry today announced that it’s finally bringing stickers to BlackBerry Messenger (BBM). The feature will begin as a limited external beta, alongside a new area of the cross-platform messaging service called BBM Shop. Similar to its competitors, stickers will be separated into ‘packs’ around a specific character or theme. BlackBerry will be promoting a set of original characters to begin with, called CosCat, Gilbert’s Tales, Bubble Bot, but it’s likely that roster will increase over time. Facebook and Path, among other apps with a messaging compontent, have offered characters from well-established brands such as LEGO, Peanuts and Despicable Me, to tempt users and their hard-earned cash. BlackBerry said it would do the same with characters from TV shows and movies, although it stopped short of giving examples or what the pricing structure would be. The move isn’t original by any means, but it’ll make BlackBerry more competitive with some of its closest rivals. Given all of the attention bestowed upon Facebook and WhatsApp recently, BlackBerry needs to make sure that it doesn’t lose any traction of its own in the coming months. While pricing wasn’t touched upon, stickers – especially branded packs – and the introduction of the BBM Shop suggests that BlackBerry is hoping this will become an important revenue stream for BBM.